Laminate has a porous structure and can be deformed, for example, from exposure to moisture. To create natural ventilation to remove moisture trapped under the laminate and to protect the flooring from contact with concrete, you need a reliable quality substrate. 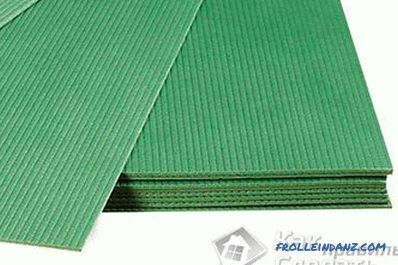 If you make the right choice of substrate, you can significantly improve the insulation of the floor, reduce the penetration of noise and extraneous sounds into the room, as well as somewhat extinguish the loud knock from the heels. In this article we will describe how to choose a substrate for laminate flooring for an apartment and a summer house, consider various materials and the required thickness of the substrate. High moisture resistance. The material must not pass moisture, otherwise a fungus may appear under the coating, contributing to the destruction of the laminate. Treatment with bactericidal agents. High-quality substrate, as a rule, is impregnated with a special solution that prevents the multiplication of various microorganisms under the laminate. 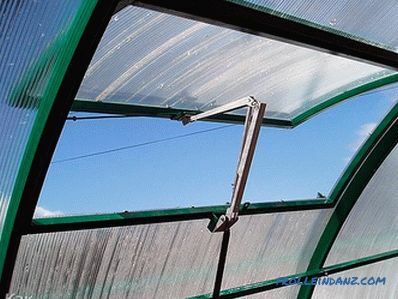 Ability to create microventilation of the laminated coating and remove condensate. 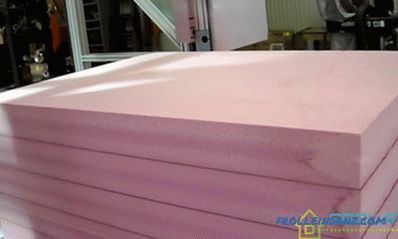 Polyethylene foam substrate . 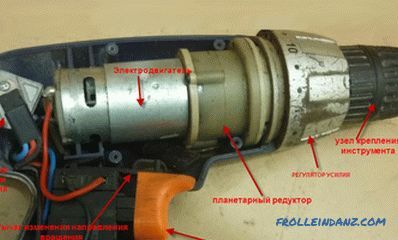 It is made on the basis of an isolon (foamed polyethylene). It is considered the most economical option. This kind of film serves for many years. The substrate is easy to fit. You can connect it with ordinary tape. This material breaks quite easily because of what it is necessary to act very carefully in order not to accidentally tear the film. The main disadvantage is that such a substrate shrinks, thickens sufficiently, and after a period of time begins to absorb less, which leads to the formation of irregularities on the floor. is a fairly cheap material. with continuous operation is pressed. It is a two-layer durable material, the layers of which are joined with an adhesive. The first layer of the substrate is polystyrene, and the second is aluminum foil. Floors using a polystyrene substrate are warmer due to the fact that heat transfer between the rough cement floor and the laminate is reduced. It is necessary to lay this material with the foil up. The process of laying is somewhat more complicated than laying a substrate made on the basis of an isolon. This material is fastened with a special aluminum tape. 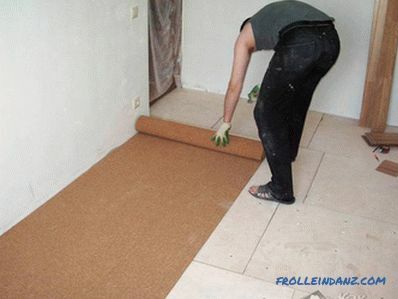 It is an excellent basis for laying a floating floor. An important property of such a substrate is that it is practically not pressed under pressure. Its service life is so great that it can last almost longer than laminate. Pretty easy to fit. Before proceeding with the installation, the entire surface of the cork substrate should be treated with water repellent. 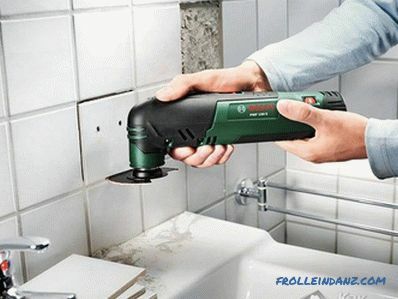 The necessary tool can be purchased at building materials stores (bitumen or rubber may be used). 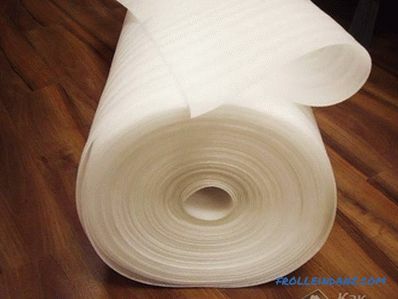 It is not recommended to use this type of material in rooms with high humidity (for example, in kitchens or bathrooms). Note that no water-repellent agent is not able to fully protect cork material from moisture, and the ingress of moisture leads to its deterioration. Substrate Thickness for Laminate The optimal thickness of the substrate is from two to five millimeters. The choice of thickness depends on the type of material chosen, its degree of strength, thickness of the laminate coating and curvature of the floor. It is desirable that cork substrates are not thicker than two to three millimeters.The thickness of the substrate of polyethylene must be about five millimeters, because over time it will sag and this will certainly affect the quality of the laminate laying. 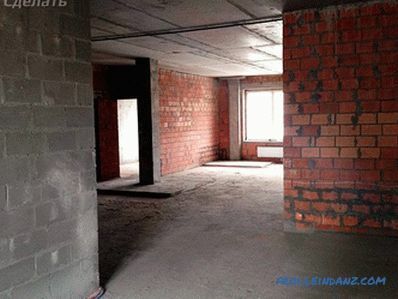 In rooms that require additional sound and heat insulation, it is recommended to use a thicker layer of substrate. A thick layer of the substrate can cause an increase in the load on the lock fastenings of the laminate. Some manufacturers produce a laminated coating with an insulating material pre-attached to it from below. 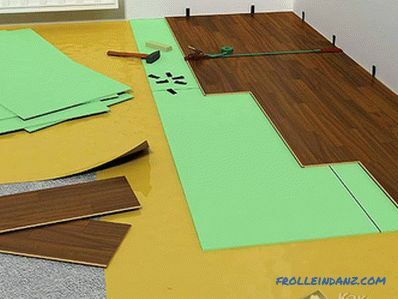 This is typical for laminated flooring class 32 and 33. Of course, this type of laminate is very convenient to install, but it will cost you dearly. Before you stop the choice on a specific type of substrate, weigh all the pros and cons. Properly chosen substrate will help you increase the life of the laminate and improve the performance of the floor.